This survey will review some of the recent evidence which indicates that activation of primary afferent fibres provokes synaptically-elicited responses in the spinal cord which are due to activation of peptide receptors and therefore, by inference, that peptide release has occurred. Such responses are, perhaps, most clearly demonstrated from extracellular and intracellular electrophysiological studies in vivo. 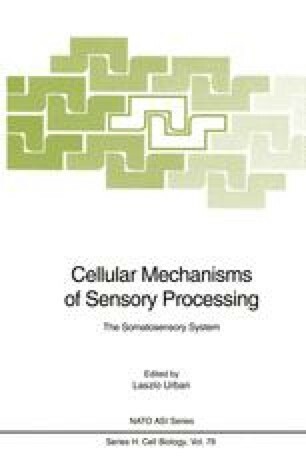 In fact, these in vivo studies also indicate a specificity of the actions of at least some of these peptides to certain modalities of sensory impression, most notably nociception. Furthermore, spinal reflex studies not only confirm a role of peptides in the transfer of nociceptive information, but they also indicate that release is sufficient to cause physiologically relevant changes. This survey will also touch upon two further aspects pertaining to the functional role of synaptically released peptides. One is the mechanisms by which peptide receptor activation is expressed and the other is the interaction of peptide systems with other transmitter systems.